Last year my boss emailed everyone asking what charities we volunteer for so that she could write a warm and fuzzy holiday season blog post. Um, what charity? Whoops. Given that we had just moved to a new state, I hadn't gotten involved in anything yet, so I was scrambling to find an answer. Why not use my handy-dandy crafting skills? I ended up selecting The Ships Project to make hats for our overseas soldiers and used K as my "head" model for proper sizing. What charities do you like to knit or crochet for? You're probably too hard on yourself. 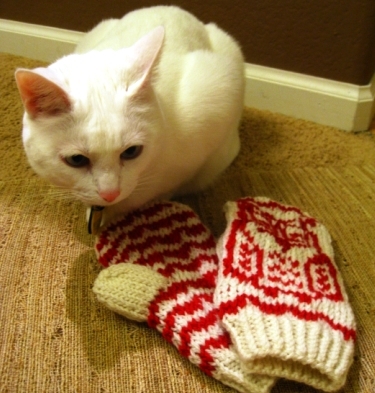 The mittens look great! @Seth Lol! You, sir, are awesome. How lovely, Diana! Your dedication and hard work are surely appreciated by those you help. :) Thanks for the link! I actually don't knit or crochet for charities but the majority of my crochet are gifts for special occasions. Our charity was so fun - Secret Santa for foster children! And, we also got to help with the Samaritan's purse shoe boxes. Great suggestion about Samaritan's Purse. Found out my church also has a craft group that is selling their crafts to make money for donation. Too bad the craft group meets during the day.